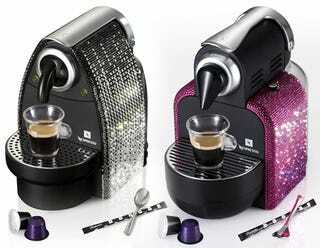 Good gawd, now they're adding those tacky Swarovski crystals to coffee makers? Nespresso, which should know better, brings you a choice of pink or black sparkles on its Limited Edition Essenza machines. These little "Crystal Couture" espresso makers will set you back $1,000, and there will only be 100 of each variety made. Maybe this is a great idea for espresso coffee machine collectors. That, along with luxury doggie hotels, is yet another harbinger of the fall of the Empire. That's a nice head of crema foaming up on top of those little espresso cups, however we're not convinced that all those crystalline pieces of plastic spangled all over the outside of these machines will make the coffee taste any better. But then, stranger things have happened.